Pointway Performance Coaches Dan Chabanov and Tim O'shea will be serving up a fun and informative cyclocross experience for people of various skill level. Do not be intimidating if you are new to the amazing sport of Cyclocross, remember everybody gets a turn at being new--its no biggie-- come on out. If racing is “old hat” for you, we have you covered. Elite racer and coach Dan Chabanov will be ready to help you find those coveted “marginal gains” that all experienced racers seek. 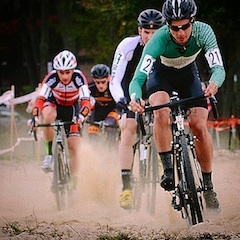 Cyclocross is a unique sport and has a unique skill set requirement. Lets try and accelerate the learning curve. At PWP we tell our athletes to “enjoy the process” when it come to ‘cross skills, its crucial to “know” the process! The Sunday clinic closes with a question and answer period and a discussion on race day prep and nutrition. The camp is held rain or shine but will be canceled if there are thunderstorms. You pull into the park and park along then gravel road. But if it fills up there is tons of street parking. As you pull in to the park there is a gravel path first thing on the left that goes out to a grassy open space and we will be set up there.